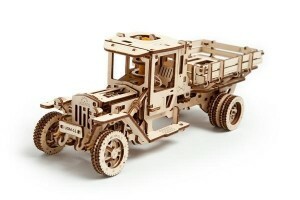 The UGM-11 Truck is equipped with a four-cylinder rubber band engine. Start the engine in 'idle mode' and look at four pistons which move realistically under the folding hood. Open the cabin door and observe the fully functioning steering wheel connected via a steering column to the suspension bracket of front wheels. Push gas pedal, put it in 'reverse' or 'drive' mode, engage the clutch and see how the Truck’s moving! Working on a mechanical kit is incredibly exciting, right? Even if it takes you a few hours to assemble the model, the end result is definitely worth it! That is why you will have a blast with the UGM-11 Truck construction set. The four-cylinder engine is propelled by the crankshaft that draws its power from a fully-functional drive shaft turned by a rubber band engine via a system of gears. There are 3 modes - forward, backward and idle, which can be activated using the gear change lever on the side. If you wish to observe the UGM-11’s operational mode, switch on the engine in idle mode to check out the four pistons moving under the folding hood. You can also peek via the cabin door – you will notice the fully functioning steering wheel connected via a steering column to the front wheels suspension. The rubber band engine winds up with a lever mechanism on top of the cabin and a working gas pedal heightens the realistic aspect of this construction kit. The “open structure” is chosen purposely so the basics of the advanced design can be fully appreciated. No need to use glue or special tools as the parts are self-assembled – just follow directions and connect the parts accordingly. Display your handiwork once it is complete – there are several places in your home that can be used as vantage points. The truck is a perfect rubberpunk – the clockwork and steam punk worlds merge brilliantly. Since this model belongs to a newer range of mechanical kits from UGEARS, it could take slightly longer to complete – we have included a detailed instruction manual to guide you through the process. Gift it to your loved ones, or buy one for yourself – these kits are extremely popular, so please hurry and place the order.